I love simple, unfussy meals that nourish me on all levels. And summer produce plays a great role in these kind of dishes. So before the summer slips away, you must eat a tomato sandwich. 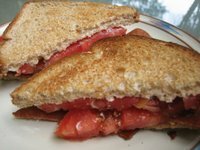 In my childhood, this was a rite of summer: sun-warmed, garden-fresh tomatoes, butter, mayo and crispy bacon on toasted white bread. Today, I make the sandwiches a bit differently, but the taste takes me back to the carefree summer days of youth. Be sure to select your tomato with care. No average grocery store tomato will due for this sandwich! If you don't grow your own tomatoes, seek out a farmers market, tailgate market, roadside stand or generous neighbor for a truly ripe tomato. Try a low-acid yellow fleshed tomato or a unique heirloom for variety and deeper flavor. And to get nice clean slices, use a serated bread knife. It really works! 1. Lightly toast the bread. Spread butter on one slice and mayo on the other. 2. Pile on tomato slices and cooked soy bacon. Sprinkle with sea salt. 3. Serve with a napkin to wipe your chin! ooh that sounds good right now. what brand of "bacon" do you use?? I tried morning star and realized they weren't vegan are there any vegan brands?? I was just telling my new European friends about the wonders of a good, southern tomato sandwich. What a delight to then get a great recipe to pass onto them!